The Reporting page displays the results for a trigger-based campaign. Details about these statistics are described in the Reporting details section. Below the overview stats, you can see how each variant of your campaign performed, by comparing how often campaign goals were reached. Using the drop-down menu, you can select a campaign goal; the graph displays how often the selected goal was completed for each campaign variant. 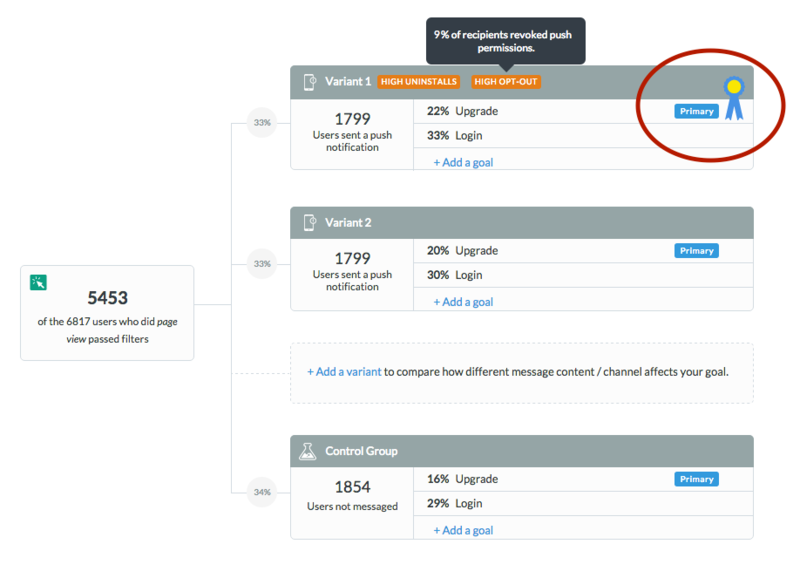 Control groups are an excellent way to see whether or not your campaigns are driving users to your goals. A control group will not be sent a message, but is still measured for goal conversion. You can then take the control's goal percentage and subtract it from your variants' goal conversions. The difference indicates the lift - i.e. the net effectiveness of each variant. If the lift for a variant is small, or in some cases smaller than the control, it is recommended that you turn off the allocation for said variant. This way you can reduce the amount of messages you send while maximizing your impact. Triggered and passed filters, information on the users who did not meet the campaign requirements. Messaged users, the number of users who received the campaign message and how they performed. Did primary goal, the number of users who reached the target goal. Negative impact, the number of users who removed themselves from the campaign, or from all campaigns. Missing contact info: These users did not have the necessary contact info to receive a message. This attribute will change based on the channel being used to message the user. For Push notifications, it means the user does not have a value for APNS or FCM. Previously unsubscribed: These users have unsubscribed in the past and were not sent a message. Failed to send: This generally means that the contact info for this user was incorrect. In the case of mobile push, it usually means invalid APNS or FCM values. If all messages are failing, it's possible your certifications have expired. These can be updated on the settings > providers page. Frequency capped: These users have already received a message and cannot receive more based on the frequency cap specific to this campaign. # of messaged users: How many end-users received the message. # of opens: How many end-users opened the message. 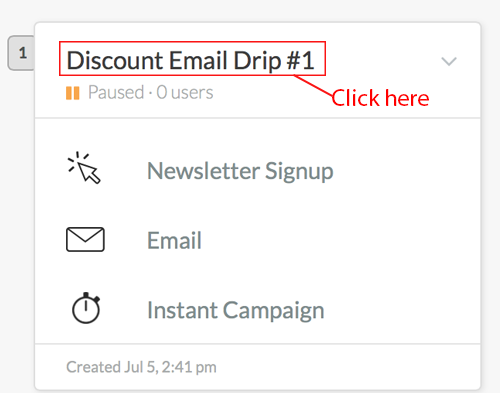 # of clicks: How many end-users clicked on the message???? Goal: The number of users who reached a specific goal. Unsubscribed from campaign: The number of users who received a message and unsubscribed from this specific campaign. Unsubscribed from all messages: The number of users who received a message and unsubscribed from all future campaigns. This campaign is likely to bring you the best conversion to your primary goal. At this point you may choose to allocate 100% of your traffic to this variant. You may also want to generate new variants to continue testing against the winning variant. All of this can be achieved by editing the original campaign.